Entrepreneurs and leaders face big questions every day. How should you be focusing your efforts? What will your idea look like in real life? How do you start? How many meetings and discussions does it take before you can be sure you've got the right solution? Now there's a sure-fire way to answer these important questions: the sprint. 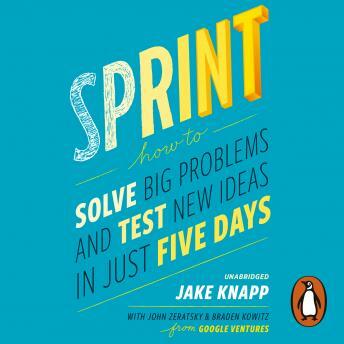 Created by three partners at Google Ventures, the sprint is a unique five-day process aimed at helping businesses to answer crucial questions and deliver the best results in the least time, allowing the business to move on to the next level. It's a 'greatest hits' of business strategy, innovation, behaviour science and design thinking - packaged into a battle-tested process that any team can use. Jake Knapp created the five-day process at Google, where sprints were used on everything from Google Search to Chrome to Google X. With John Zeratsky and Braden Kowitz at Google Ventures, the team has run more than one hundred sprints with startups across all kinds of business, including mobile, e-commerce, healthcare and finance. Sprint is about arming your business with a process to get problems solved by short-circuiting the endless debate cycle, avoiding groupthink and utilising the people, knowledge and tools that every team already has. It's for companies or groups of any size, from small startups to Fortune 100s, from teachers to non-profits - anyone who has a big opportunity, problem, or idea, and who needs to get started.